March has been a busy month at work, and when that hasn’t been occupying my attention, CODE | WORDS has. Think lots and lots of phone calls, Google Hangouts, and collaborative editing of documents. It was therefore a wonderful break to escape to Baltimore for a few days for the Museum Computer Network board meeting and Museums and the Web 2014. 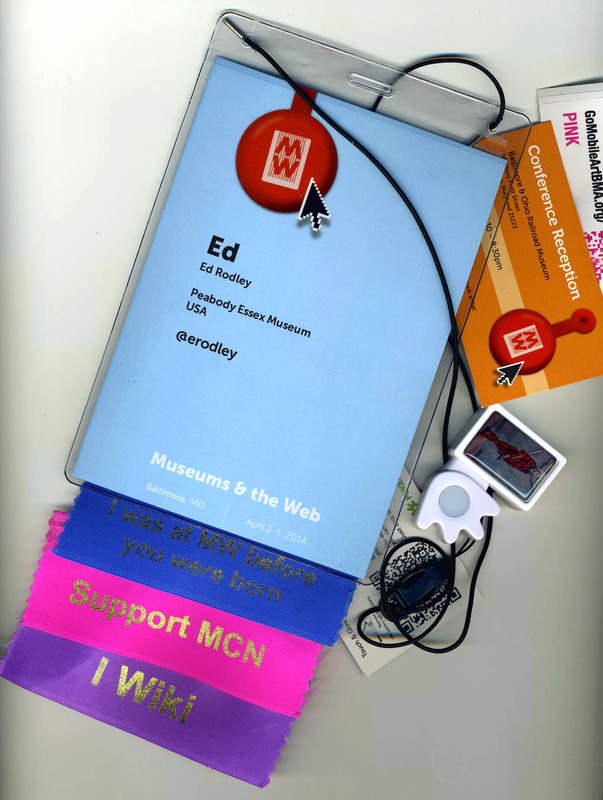 Museums and the Web 2014 has ended, and I am so glad I was able to attend! The sessions were excellent, the conversation lively, and I came away feeling energized and excited about what the coming year holds for us. There was so much going on that my attempt to unpack it in a nice, brief post failed before it even left outline form in my notebook. So, I’m going to have to spread it out based on the themes that emerged for me. After you’ve been in the business awhile, one of the reasons to go to conferences is to see who’s moved in, who’s moved up and who’s moved along. And there was plenty of two of the three. Which is both encouraging and discouraging. Given the price tag of conferences these days, it is always a pleasure to see younger colleagues, and particularly students coming and participating. I had some great conversations and inevitably, a lot of “What should I do?” talks with people. Some of the things I found myself saying over and over again included the following observations. I think Museum Studies certificate/degrees continue to become less of a differentiating variable, and more of a box to tick. The resumes I see will almost all have some kind of museum studies credential on them, so if you’re looking to stand out from a crowded field, that will only save you from the initial cull. All of the resumes I’ve seen in the past few months that really caught my attention had something else in them; a concentration in media studies, design courses, education, etc… Don’t get me wrong, I think Museum Studies credentials have merit, but I don’t think they’re enough to get you into the field. And if you’re just embarking on your career, getting in is all that matters, right? I’m also not suggesting getting even more degrees. Just look at your courses, and your peers’ courses and find that thing that’s going to make you stand out. It’s nobody’s job to get you unstuck other than you. Can’t break into the sector? Can’t move on? Difficult boss? Visionless administration? Chronic understaffing/budgeting/resources? Whatever the problem, in the end, it comes down to you. Seeking outside advice and counsel is a great tool to helping you get clear about your goals, but it’s no substitute. Stop thinking about where you want to work, and think about who you want to work with instead. Given the peculiarly public-facing nature of digital projects and products and the small size of the community, it’s relatively easy to look at interesting, innovative work and figure out who made it. They also move around, so if you focus on the museum instead of the person, you run the risk of applying somewhere where someone innovative used to work. Do your homework. Find examples of work that speak to you, figure out who made it, and find out where they are. Go to the conferences. I know they’re expensive, but most of them offer scholarships and/or volunteer discounts. Find them and ask them about their work. Very few people I know hate to be asked about the work they’ve done. It’s a great conversation starter. It was a lovely pre-conference gift to hear in January that Nancy Proctor had been appointed Deputy Director for Digital Experience at the Baltimore Museum of Art. Nancy has been a friend and colleague for many years and it was heartening to see another colleague who combines a passion for museums with a deep understanding of digital technologies climb into the senior management ranks. I look forward to seeing what she’ll do in the coming years. There’s a lot to look forward to. The number of C-level positions like Nancy’s being created seems to be going up every year. And the pool of candidates is full of some of the brightest, most committed, thoroughgoing professionals you could ask for. I only worry that the growth rate of CDO-type positions won’t match the rate of colleagues leaving the field. Some flux is inevitable in a workforce, but this year has been particularly turbulent, and mostly flowing out of the field and not so much in. A couple has turned into more than a handful very rapidly. I joked with someone that in a few year’s time, I’d find myself sitting alone at the bar at MCN or MW if things don’t change. It wasn’t a very pleasant picture. And I don’t know what to do, other than hope at this point. That’s a bit of a downer, I realize, but one of the wonderful things about conferences is that they crystallize things. You start to see big pictures arise out of lots of little things. Sometimes it’s good, and sometimes not. But I’d always rather have specific fears than vague ones. The next post will be peppier and look at all the energy around grass-roots museum advocacy. There’ll be invasions, clubs, and drinking! I didn’t get to go to MW14 but I had a lot of colleagues who did. I enjoyed the live-Tweeting and the retrospective musings of everyone who attended. Your takeaways – especially about thinking about who you want to work with rather than where you want to work – are huge for me. Thanks for that! I did want to say something, however, about the Museum Studies degree. I know you know, but half the reason why a program is important is because of the connections you make, either with cohorts, professors, or intern/externships. The relationships I made have been essential to me, for professional AND personal reasons. They are a group of people from all over the country and the world (thanks to my online program) and I connect with many of them daily, even if it is just to share an article or even a joke. I love that they are there for support, to show me new things, and keep me abreast about what’s happening in the field around the globe. On top of all that, even though I had been working in the field for 10 years, having a solid theoretical background added to my experience has really only strengthened my ability to do my job. I just wanted to put a good word in for all the programs out there. We might all have them on our resumés but I think it is awesome to be part of a field that is moving towards that kind of professionalization. And combined with experience and gumption, we can really get somewhere! I hope I didn’t come off sounding like there was no reason to get a Mus Stu certification, because that’s not the case. There’s a tremendous amount of foundational knowledge that one gets in a program that would be hard to come by otherwise. Relationship building, starting a personal professional network, and becoming part of a community of practice are all invaluable tools in the field. My comment was really specifically focused on getting an interview and an offer. The museum job market is never great, and the pool is large. A resume’s purpose is to get you an interview, nothing more. And if the only thing on your resume is on everybody else’s, then you’re not likely to make the cut.